In the chaos of the Chinatown street market the sound of the waitresses saying "Sawasdee kha!" rings out like an angel. We used to be quite down on here as the Thai food was really toned down in its kick to accommodate a tourist's palate, but on a more recent visit, we found the food had improved considerably both in taste and presentation (along with a revamped menu and inching up prices for that matter) and would certainly return if in the area. The Thai salads here are particularly good and if you just check that it will be spicy, they'll be sure to deliver the goods. Prices are moderate and given the location, not unreasonable and the staff are friendly and fast -- if a bit heavy on the pressure to order a chilled Singha Beer from the wall of fridges -- go for the milky iced tea. Sawasdee Thai Food is on Pagoda Street in the midst of the Chinatown Street Market and as such is busy with a lot of passing people watching fare. The closest SMRT station is Chinatown which is just a minute or so away. 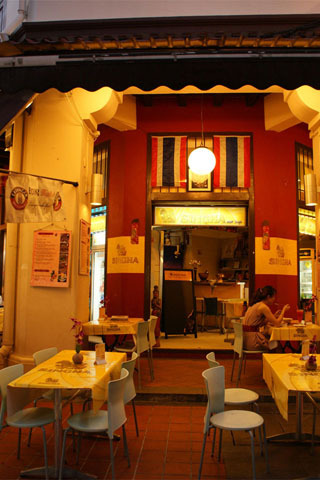 We'd not travel across Singapore to eat here, but if you;re in the Chinatown area and feel like Thai, this is a solid option.